In those early days of motherhood, I was often found spoon-in-hand weekdays around 10:30 dipping into the frozen pint of utopia humbly sitting in our freezer. I love me some good ice cream. Silvie turned one last month, and thankfully we're getting much more sleep these days. However, I still love my ice cream and often do indulge in a mid-morning spoonful. Adirondack Creamery should be called Adirondack Dreamery. They are an ice cream maker from upstate New York. 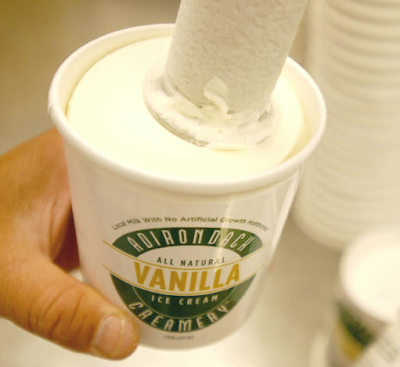 They use only real ingredients, with (hormone-free) milk and cream sourced from local dairy farms. You can find them at retail grocers in and around New York City including Whole Foods. A couple of weeks ago, I picked up a pint of Kulfi-Pistachio Cardomom. It was probably the most surprising ice cream taste I have ever experienced. Spicy and warm mixed with cold and creamy. Such a yummy treat.